Karen Wilkin is a well-known curator and critic specializing in modernism. 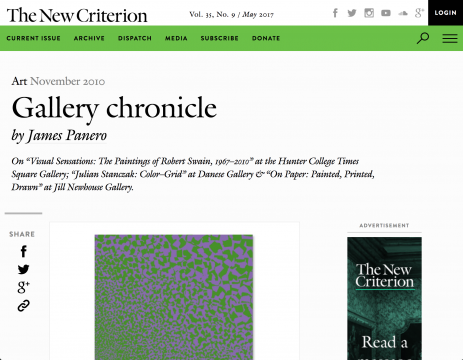 A regular contributor to the Wall Street Journal and the New Criterion, she is Contributing Editor for Art for the Hudson Review and the author of monographs on Giorgio Morandi, Hans Hofmann, Stuart Davis, David Smith, Anthony Caro, and Helen Frankenthaler. Ms. Wilkin has organized numerous exhibitions internationally. She teaches in the MFA program of the New York Studio School. Born in Massachusetts in 1958, John Gibson attended the Rhode Island School of Design and the Yale School of Art and Architecture in New Haven, earning an M.F.A. in 1982. Gibson exhibited in New York at the Allan Stone Gallery and in 1989 became visual arts professor at Amherst College in Northampton, Massachusetts. He regularly exhibits at galleries throughout United States, including Gerald Peters Gallery. Gibson has taught at Smith College, Hampshire College, and Rhode Island School of Design. His works are in numerous museum and private collection including the Metropolitan Museum of Art and Museum of Fine Arts, Boston. In his artwork, John Gibson paints seemingly simple depictions of spherical shapes within space, in endless variation. Underlying the simplicity is a complex array of artistic and emotive concerns. Gibson plays with space, form, and color, and proposes classical problems and opportunities of figure and ground, the turning of form into space, and the balance of color. Gibson currently lives and works in Northampton. Wendy Mark is a painter and printmaker primarily known for her monotypes. Her exhibitions often include collaborations with poets and writers and she has produced limited edition books with the Pulitzer Prize winning poets, Mark Strand, Charles Simic, Paul Muldoon and David St. John. Other writer collaborations include Adam Gopnik and Louis Menand. Mark began as a writer and received her MFA from Columbia University's School of the Arts, writing division. She has had numerous solo exhibitions in New York at ACA Galleries, Forum Gallery and Lori Bookstein Fine Art. Her monotypes were included in the historical exhibition at The Smithsonian Institution “Singular Impressions: The Monotype in America". Other museum shows include: The Lyman Allyn Museum in CT., The Metropolitan Museum of Art, NYC and The Hiroshima Museum of Contemporary Art in Japan. In her work Mark is influenced by both the poetry of the 17th C. metaphysical poets and by the Italian Renaissance and Dutch Landscape painters. She sees her art as the re-expression of concepts and images from those words and paintings. She writes: “The idea of disappearance, of endings and loss are important to me. But my images of atmospheric changes, dots and cloud-like forms refer forward to computer generated images and cartoons. An expression of both the Romantic and Humorous nature of things." Wendy Mark was born in New York City in 1950 and currently lives and works there. 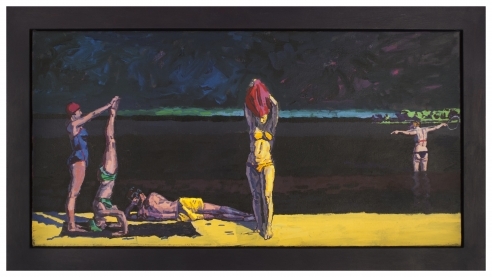 Born in Viareggio, Italy in 1945, Mannocci moved to London in 1968. He is an accomplished painter and printmaker, as well as the author of the scholarly book The Etchings of Claude Lorrain. He studied at the Camberwell School of Art from 1970 to 1973 and the Slade School of Art in 1974, receiving his postgraduate degree in printmaking. A descendant of the Metacosa artists’ movement, Mannocci began to regularly exhibit his work in the early 1980s and has shown at galleries throughout Europe, including the Curwen Gallery in London, the Greiser Gallery in Heidelberg, the Galleria Ghelfi in Vicenza and Studio Steffanoni in Milan, as well as “Nature morte” in New Delhi, the Jehangir Art Gallery, Mumbai, the Julie Saul Gallery in New York, and the P.Iannetti Gallery in San Francisco. Mannocci’s artwork is also part of public collections such as British Museum in London, the Altonaer Museum in Hamburgh and the Jenish Musée in Vevey. In his artwork, Lino Mannocci creates imaginary scenes that are often mythic and oneiric in subject matter. He uses a limited palette in oil paint, but opens himself to a range of other media which often include monotype and the treated postcard. Mannocci’s range in media is deliberate. He uses their textures to create meaning both formally and emotively. Mannocci often depicts mythical and religious figures like Ganymede or the archangel Gabriel, and uses them in depictions of lost scenes from known stories. He currently lives and works in London and Montigiano, a small hilltop village in Italy just outside his birthplace. Born in England, Nickson studied at Camberwell School of Arts and Crafts (BA) and the Royal College of Art in London (MA) 1972. He was based in Italy from 1972-74, and since 1976 has resided in New York City where he has been since 1988 a faculty member and Dean of the New York Studio School and the originator of the internationally renowned “Drawing Marathon”. Nickson has worked, exhibited and taught extensively in the United States and abroad, and is the recipient of numerous international prizes including the Prix de Rome, The Harkness Fellowship at Yale University, the Guggenheim Fellowship, and the Ingram Merrill Fellowship. Nickson’s recent solo exhibitions include the Naples Museum of Art, FL (2007), Boca Raton Museum of Art, and the Lillehammer Art Museum in Norway (2007). His work is in the permanent collections of many institutions including the Metropolitan Museum of Art and The Museum of Modern Art, NY; The National Gallery, DC; Fogg Art Museum at Harvard University, MA; The Albright Knox Gallery, NY; the Neuberger Museum of Art, NY; the Frye Art Museum, Seattle; The Lillehammer Art Museum, Norway; and the Boca Raton Museum of Art, FL. A conscientious observer of nature, Nickson has been an important influence on contemporary figurative painting, both as a painter and a teacher. Enrico Riley is an Assistant Professor of Painting and Drawing at Dartmouth. Born in Waterbury, Connecticut, Riley received his BA in Visual Studies from Dartmouth in 1995, and his MFA from Yale in 1998. In 2004, Riley was awarded the American Academy of Arts and Letters Purchase Prize for the work Giant Steps, now in the collection of the Virginia Museum of Fine Arts. In 2007, he was awarded a Guggenheim Award. Riley has exhibited regularly since 2000 including solo shows at the Pageant Gallery in Philadelphia and the Karl Drerup Art Gallery in Plymouth, NH. In New York, Riley’s work has been included in group exhibitions at Lori Bookstein Fine Art and Reeves Contemporary. Riley considers the source work for his drawings very important. The subjects include maps of star constellations, poetry, and improvisational music. His work asks the question can rationality, as represented by pattern or methodical process be empathetic; and can the visionary or intuitive be rational. Kikuo Saito was born in Tokyo, Japan and moved to New York City in 1966 where he studied at the Art Students League. He pursued work in both painting and set design, and worked as a studio assistant to prominent artists like Helen Frankenthaler, Kenneth Noland, and Larry Poons. Saito collaborated with such theater notables as Jerome Robbins, Peter Brook and Robert Wilson in set design. Saito is also known for his own poetic theater pieces performed at La Mama, comprised of wordless drama, costumes, light, music and dance. By the 1970’s, Kikuo Saito concentrated primarily on painting and since 1976 has been exhibiting in many group and solo shows. Kikuo Saito was an artist-in-residence at Duke University in 1996 and a visiting professor at Musashino Art University in Tokyo, Japan. In his art, Saito integrates the painterly with the calligraphic. Using a fully loaded brush he interweaves rich painterly gestures over delicate washes and an almost hidden grid. Saito often includes stenciled letters which suggest an alternative way of seeing or reading and adds a sense of structure to the more unhindered abstract strokes. Kikuo Saito lives and works in New York City. Fulvio Testa was born in Verona, Italy in 1947. He is best known as an author and illustrator of the well-loved children’s books: The Endless Journey and A Long Trip to Z, as well as the Harvard Classics Edition of Elizabethan Drama. As an artist, his watercolors and paintings have been exhibited internationally in museums, libraries and galleries since 1976. These include the Museum of Modern Art in California, Denise Cadé Gallery in New York, The Art Institute in Chicago, The Fogg Museum, and the Museso d’Arte Moderna in Italy. 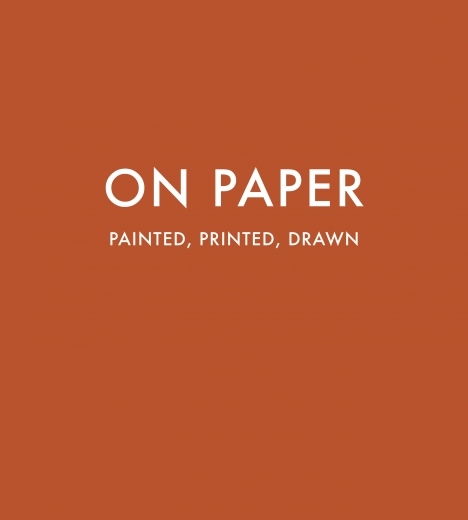 Testa’s works on paper have been the subject of essays by: art critic Karen Wilkin, The New York Times critic John Russell, and former National Endowment for the Arts Director, Dana Gioia. Often interested in collaborative projects with writers, W.S. Piero’s poems accompanied his 2004 solo exhibition catalogue. In his artwork, Fulvio Testa creates watercolor landscapes from imagination of the Italian countryside. The landscapes are distant and uninhabited and refuse specificity of place. Thus the viewer is faced with the formal qualities which comprise the image: dripping washes of color, and staccato lines, seen as a manifestation of the artist’s inner world. The artist presently divides his time between New York and Verona. A native New Yorker, Waber was a member of the Organization of Independent Artists and in 1993 was one of ten founding members of The Painting Center. She attended the New York Studio School in 1976 and Cornell University in 1978. She has shown her work in group exhibitions in the New York area since 1986 and has won the Cummington Community for the Arts prize in 1990 and the Harriet Glazier Memorial Fellowship for a Woman Artist in 1999. Waber works on several drawings at once, often revisiting them over long periods of time. She applies watercolor and drawn lines to torn pieces of paper and creates touchingly private expressions of her intimate relationship to color and form. She has an intutive understanding of plasticity and believes that a picture needs air; it needs to breathe so that the viewer an enter it.